A record 1,422 B.C. 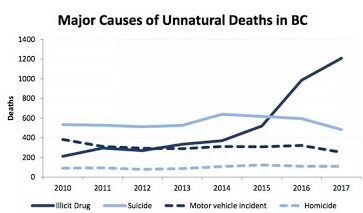 residents died in 2017 from illicit drug overdoses, with the majority related to fentanyl. Fentanyl was detected in 81 per cent of the overdose deaths. The number represents a 43 per cent increase in the number of deaths compared to 993 in 2016. Carfentanil was detected in 64 suspected illicit drug overdose deaths from June to December 2017. 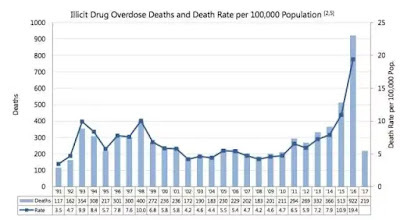 Vancouver Coastal Health Authority has the highest rate of illicit drug overdose deaths (35.9 deaths per 100,000) and also had the largest increase in rate from 2016 (50%) among health authorities. B.C. 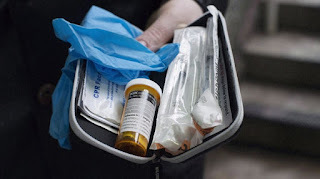 began distributing free kits containing naloxone through pharmacies in December. About 1,900 kits were made available through 220 pharmacies province-wide.